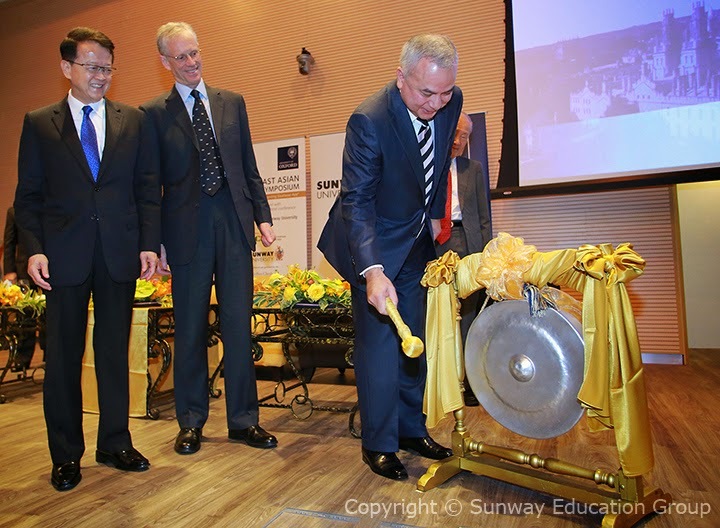 Sunway University hosted the 4th Southeast Asian Studies Symposium from 20 to 22 March 2015, the first to be held outside the University of Oxford. The Sultan of Perak, H.R.H Sultan Nazrin Shah, an alumnus of the University of Oxford delivered a royal keynote address at the event. His Royal Highness is also the Royal Patron of the Jeffrey Cheah Institute on Southeast Asia (JCI), the host of the Symposium. The Symposium themed “The Year of ASEAN: Integrating Southeast Asia” was also the first public event held at the New University Building. Dr Elizabeth Lee, Senior Executive Director of Sunway Education Group and Sunway University recently received the Visionary Women Leadership Award at the 2nd World Women Leadership Congress & Award (WWLCA) in Mumbai. The Award is conferred to the "Outstanding Women Professionals who have the vision, flair, acumen and professionalism to demonstrate excellent leadership and management skills in an organization, making changes and achieving results". Each year the WWLC honours influential women leaders in various private and public sectors who have played an important role in the development of modern economy, technology and administrative methodologies, promoting the advancement of government and business organisations at global standards. 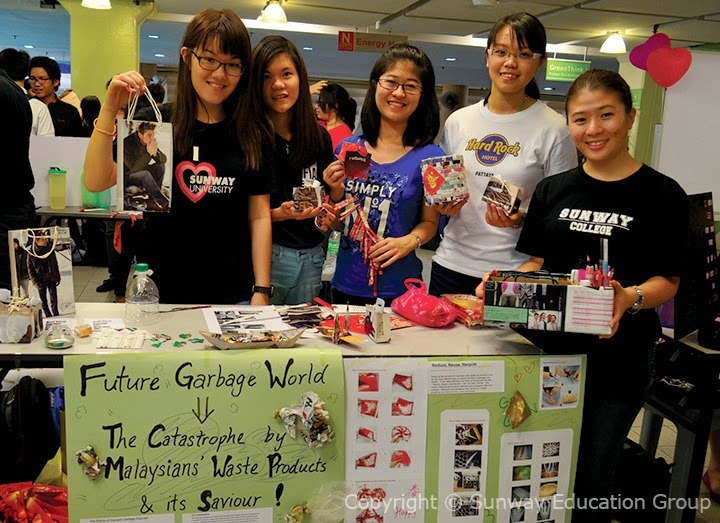 28 groups of Foundation in Arts (FIA) students unleashed their creativity over two days of exhibition at Sunway College to create awareness among their peers of what our society has become. Themed “Consumerism and Human Rights Awareness”, the students decorated their booths, invited and persuaded the public to sign their respective mock petitions based on various topics as part of their assignment to educate the public on human rights to reduce the impact of consumerism for a better world. Their exhibition encompassed issues of recycling used items, privacy rights, children’s education rights, human trafficking and child labour through the use of posters, handmade recycled products, videos and props. “I am proud and honoured to be here today for as an educator myself, I understand that a student’s educational journey is a crucial period, and because of this, it is vital that as academics who are entrusted with the task of building future leaders should constantly update ourselves with the latest developments in pedagogy, to be aware of the changing emphasis within the education arena, both on the local and global front. It is hoped that through today’s training sessions you will become more confident, reflective, innovative and engaging in your classrooms. More importantly, I trust you will inspire each other to excel further in your profession,” said Dr Elizabeth Lee, Senior Executive Director of Sunway Education Group and Sunway University in her welcome address to A Level teachers. 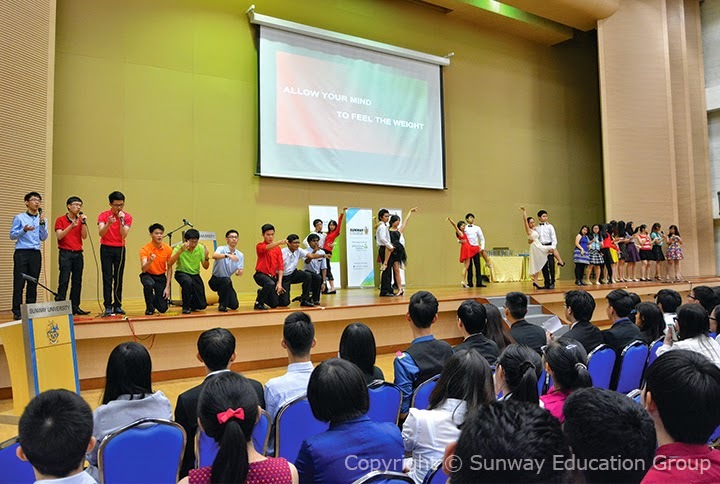 Sunway College’s A-level Tea Party has become a biannual event as its students have been constantly achieving straight As in almost every Cambridge A-level examinations in recent years. In the November 2014 Cambridge A-level examinations, students achieved a 100 percent pass rate with 64 percent obtaining straight As, making the recently held tea party substantially the largest celebration so far with 200 straight As high achievers. Among those present were the 35 Cambridge International Examinations (CIE) Outstanding Cambridge Learner Awards (OCLA) winners for their excellent performance in the June 2014 Cambridge examination series. 30 of them received Top in the World, 4 Top in Malaysia and 1 Best across Three Cambridge International A-levels Awards.